There are now 20 commonly supported projects: Avro, Flume and Solr join the group supported by all 5 distributors and other changes appear as well. For this version of the tracker (last updated in December), I’ve made one sizable change: Pivotal has been dropped as a “leading distributor,” dropping the number to five. Pivotal relies on Hortonworks’ distro (as does Microsoft) as its commercial offering now. We first identified 6 broadly supported (4 or more distributors) “Hadoop” projects in 2012, 15 in June 2014, and 17 in December 2015. The threshold is now based on 3 supporters or more: with one less distro, the line moves down. Is there an end in sight? Hardly; for one thing, I expect IBM to add a couple of projects soon. As always, the chart here is based on conversations with and/or web documentation from Amazon, Cloudera, Hortonworks, IBM, and MapR. Distributors’ public documentation of distribution contents remains variable; see Hortonworks’ page, IBM’s page and MapR’s page for their details. 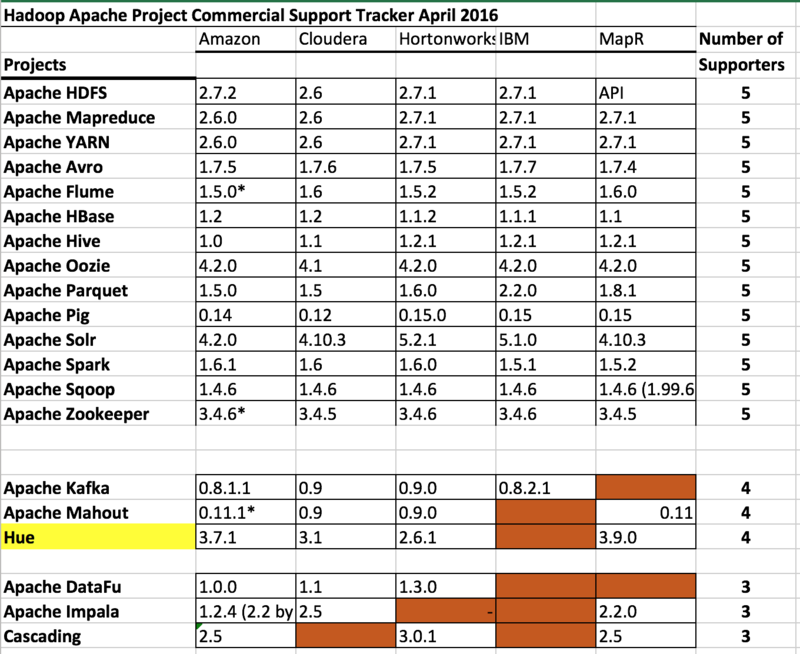 So: what is “broadly supported” Hadoop in April 2016? The Apache Hadoop web site still names Hadoop Common, Hadoop Distributed File System (HDFS™), Hadoop YARN and Hadoop MapReduce as the core components, and gives them a common release number. I leave Common out and call that 3 projects. We have 3 additions to the “projects supported by all 5 distributors” group this time: Avro, Flume, and Solr join HBase, Hive, Oozie, Parquet, Pig, Spark, Sqoop and Zookeeper – for a total of 14 projects now supported by all. Kafka and Mahout join Hue in the next group – now “supported by 4.” That gets us to 17 projects. DataFu, Impala and Cascading have 3 supporters. And now we’re up to 20 projects.